Minneapolis South Rotary has been a part of the community for 20 years. The club needs your ideas, your heart and your skills to go forward for its next 20 years. Learn how to be a part of this diverse, fun and dynamic group of change agents. Register here. Meet Minneapolis South Rotary and learn more about what this group does...and how it needs you to make action happen. Rotary is a world-wide organization with roots in every community with a club. Minneapolis South Rotary is a friendly, welcoming club that wants to make an impact in South Minneapolis and beyond. The club motto is Strength in Diversity. For 20 years, Minneapolis South Rotary has served its community through service projects, providing opportunity for youth, and giving its members the opportunity to learn and grow both personally and professionally. It's power in numbers. It's fun. It's a change-agent. 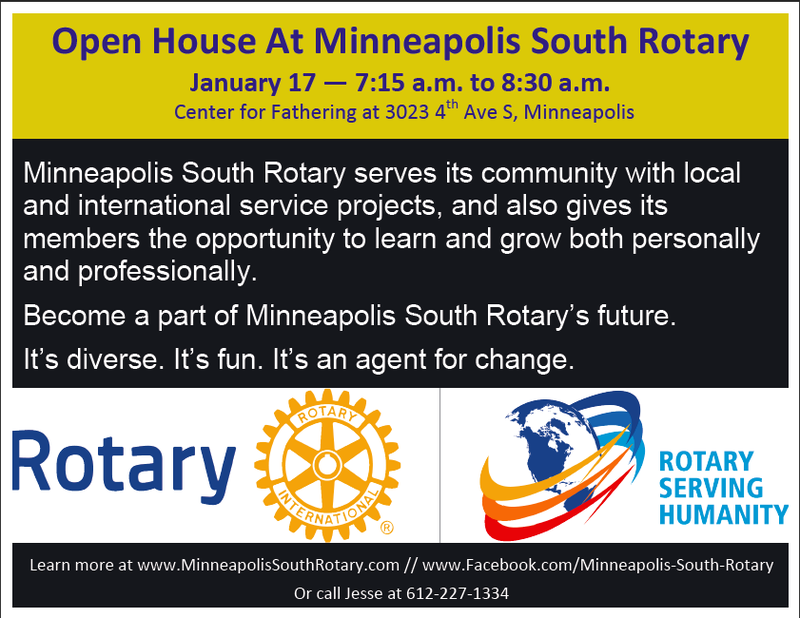 Meet Minneapolis South members at this open house to see its current projects, discover how Rotary works and help direct the club's dreams for the future.